Whether it's cold and raining, or you need rejuvenating after a long night at the Feria, the perfect solution is a steaming hot cup of chocolate and a ration of freshly cooked churros. Churros is a type of batter made to a closely guarded recipe, cooked in hot oil and is complemented by hot sweet chocolate. Feelings of chill and fatigue will evaporate as the combination warms and revitalises the body. The custom of 'Churros con Chocolate' is an unashamedly luxurious way to start your day and will keep you full of energy until lunch time. If you are in Málaga and want to sample this morning delight, here are some of the best places to find Churros. 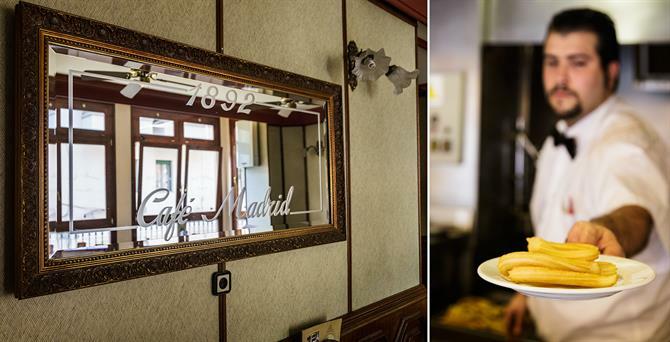 Casa Aranda is one of the most famous and most visited of Malaga's Churrerías. This may be due to its great location, but I'd say it's because of Casa Aranda's 75 years of history that makes it one of the most popular in Málaga. On this street pass crowds of curious travellers from all over the world, with the clear intention to try these delicacies making this narrow street a truly unique and a must see site. This coffee shop has stood since 1892 and remains virtually unchanged since then, it lies in the heart of Málaga and is one of the most popular cafés in the city. 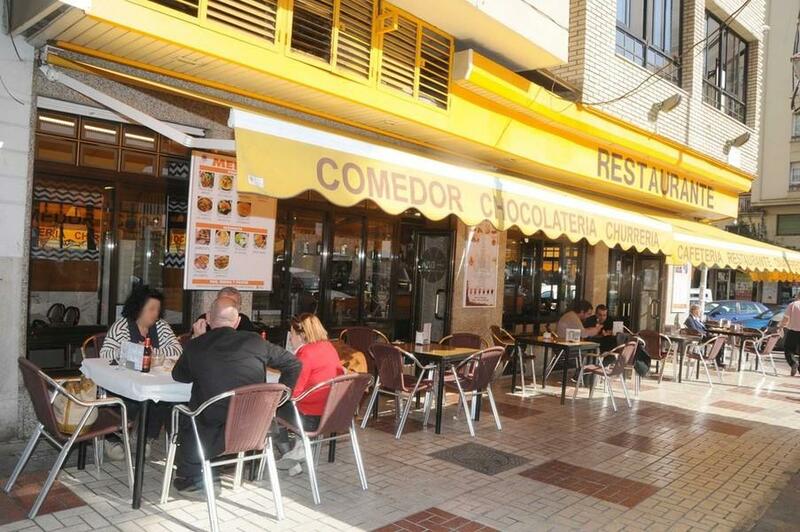 Café Madrid features a terrace that gives way to a busy pedestrian street, Calle Caldereria. The tiny terrace has a friendly atmosphere and is basked in sunshine. If the weather is not good, do not worry, you always have the option of moving inside, where you will see that typical decoration of the cafés of yore, with marble tables and walls decorated with fabrics and wood. Their Churros are known as the Madrileños and distinguished by being slimmer. Cafeteria El Sauce is a neighbourhood café and is always full, its interior is comfortable, quiet and spacious, with friendly and helpful staff. It is located in the district of Echevarría and was founded in 1977. 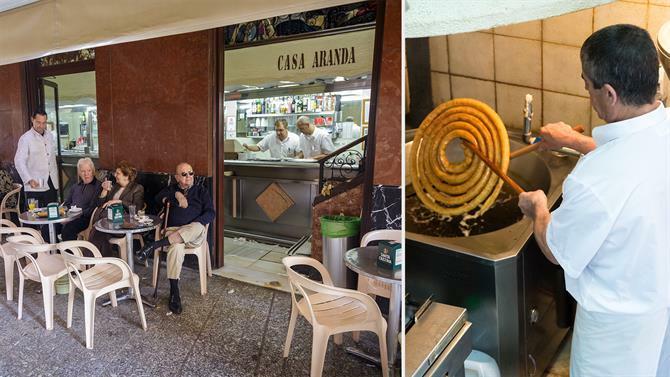 Alfredo Iglesias Martin took it over in 1983 with Granado Francisco Marquez, who has kept the secret of his famous recipe for over 30 years, producing one of the best Churros in Málaga. 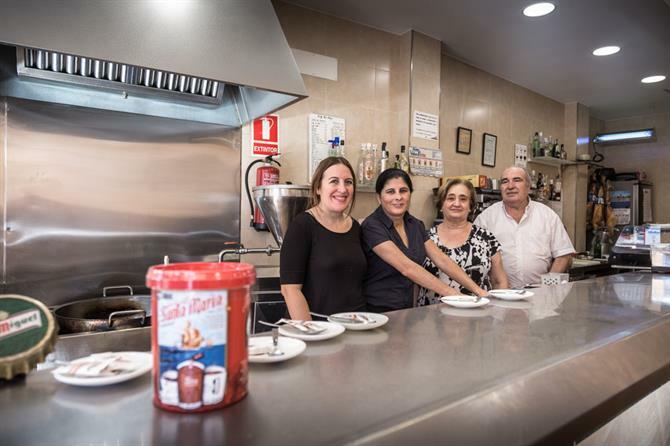 Churrería Migui is located in the east of Málaga, specifically in the neighbourhood of El Palo. Many a Malagueño has been among its four walls, either for a quick breakfast or possibly after the long night of New Year's Eve. Curiously, this Churrería was formerly a dairy and was acquired in 1956 by the Rodriguez family. Miguel Rodriguez's son continued the family tradition. 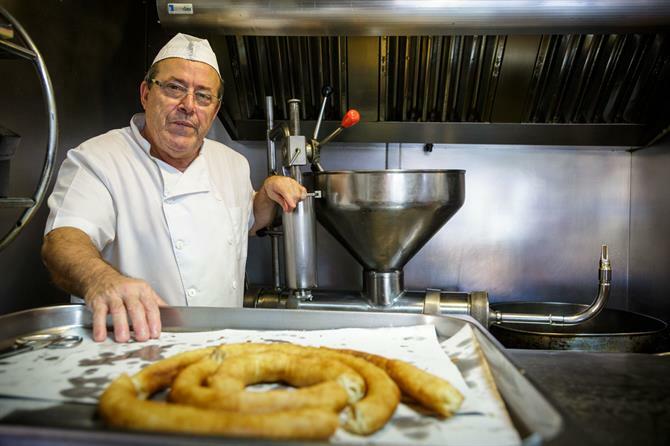 Miguel is responsible for making the Churros with a very attentive team of his wife and daughter, Elena and Inma. They take a special interest in the use of good, clean oils and making your chocolate 'Santa Maria', a Málaga brand of chocolate. Cafeteria Oña has for over 40 years been supplying fortifying breakfasts to the crowds of people who fill their local each morning. The Café, found in the area of the civil hospital, offers a wide range of products, but the highlight is its traditional Churros with chocolate, which have been produced since 1969 . "The secret is simple," new oil daily, quality flour and lovingly prepared, as they say in Café Oña, if all the churros that they have ever made were put together, it would surely outweigh Mount Everest, so if you're in the area, do not hesitate to visit them.